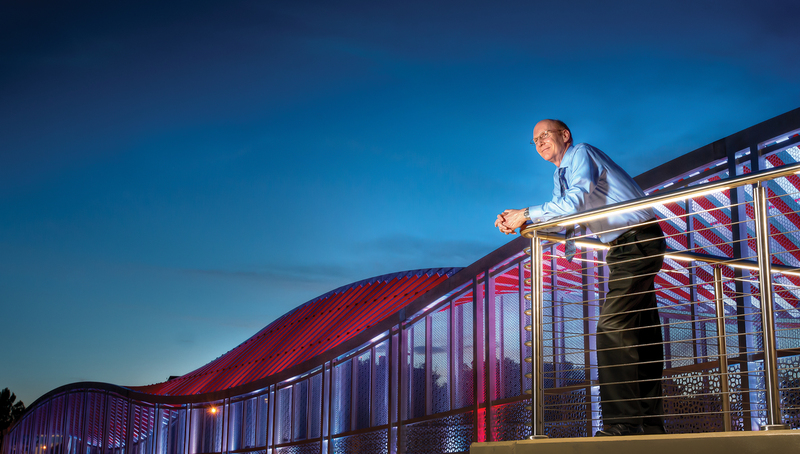 Walking across the new DNA-inspired bridge over 13th Street on the southern edge of the UF campus, Patrick Concannon looks down and sees remnants of old railroad tracks embedded in the ground and the concept of the rails morphing into the arms of a double-helix molecule changes his whole perspective on the bridge. Changing perspectives about the potential in DNA is key to Concannon’s new role as director of the UF Genetics Institute. Since arriving from the University of Virginia in February, Concannon has been focused on bringing together research from diverse parts of the University of Florida — computer science, entomology, bacteriology and mathematics, for instance — so people can see things from different perspectives. His own perspective embraces everything from the genes he studies in his laboratory to the scientists who work in the UF Genetics Institute. Concannon has made a career out of bringing together diverse fields of science and pioneering new areas of research. His research has spanned immunology, genetics, epidemiology and molecular biology. He has worked with cancer patients and diabetics, as well as patients with extremely rare diseases. His research interests have two things in common — they allow him to work on subjects that he finds compelling and they help him make a contribution to society. So when he came to interview for the position as director of the UF Genetics Institute, he found the diverse interests and disciplines of its members to be a perfect match. “I was struck by the unique opportunities the Genetics Institute affords for interactions between researchers in different disciplines,” Concannon says. As someone who has always approached scientific research from an interdisciplinary perspective, he sees his role as continuing to foster and support that atmosphere among his new colleagues. “Now I have a much larger canvasto paint on,” he says. The Genetics Institute includes more than 230 researchers in different colleges and on different campuses, and Concannon has been visiting with as many of the scientists as possible to get a sense of the strengths and challenges the institute faces. One of the institute’s strengths lies in its diversity: Researchers study aspects of the genetics of insects, plants, pathogens and humans. The targets differ, but the quest to understand these organisms at the genetic level ties the research together. Indeed, Concannon’s own research reads like a multidisciplinary manifesto. He examines the role of genetics in areas as diverse as Type 1 diabetes, breast cancer and radiation sensitivity, and malnutrition. His laboratory has more than $12 million in support from federal and non-profit organizations. He sees the evolution of his research as a microcosm for the field of genetics as a whole. He started out focusing on autoimmune diseases and began to look at the genetic aspects of these diseases, particularly Type 1 diabetes. A colleague introduced him to a group of people who had two rare genetic disorders that are characterized by hypersensitivity to ionizing radiation, and he realized that he might be able to do research that could directly benefit these people. He began to work on mapping and identifying the particular genes responsible for these diseases. He then went on to study the function of these genes, which required boning up on cell biology and biochemistry. “Some of the best ideas in science come from the interface between disciplines,” Concannon says. Soon he found himself working on a similar problem in women who develop contralateral breast cancer, where distinct tumors form in the opposite breast from the original tumor. The theory was that the second independent tumors might be caused by the primary treatment of the first tumor with radiation. This work required learning epidemiology and opened up another area for Concannon — individualized treatment based on genetics. Because of this new interest in individualized treatment, he began to collaborate with Stephen Rich of the Center for Public Health Genomics at the University of Virginia to look at the role of genetics in the epidemiology and treatment of common, complex human diseases. With other collaborators at UVA, he began to look at genetics and the effects of malnutrition in developing countries. People who don’t get adequate nutrition end up with stunted growth, frequent infections and cognitive problems. This can be addressed with adequate nutrition, but it turns out that some people respond well physiologically when they begin receiving the right kinds of food, while others do not. Concannon and his colleagues obtained a grant from the Bill and Melinda Gates Foundation to study the genetics of the people receiving food to see if their genes affect their physiological responses to better nutrition. They have programs in Bangladesh, Brazil and the Gambia. different buildings. By continuing to create a common forum and common platform of tools for those studying genetics at UF, Concannon hopes to continue building on the institute’s excellent reputation. While Concannon says he sometimes misses time spent in his lab, he has enjoyed being able to have an impact at a broader level by helping scientists get the things they need to succeed. He sees himself as an advocate and supporter of the scientists who work in the institute.